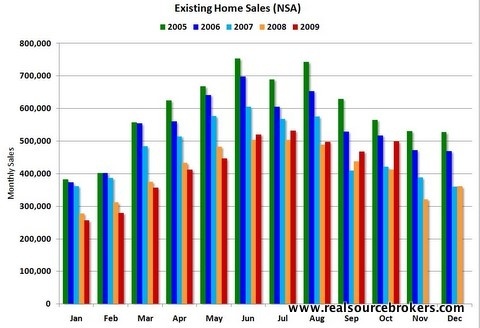 There are a number of ways to analyze exisiting homes sales. Today I'm looking at comparative monthly homes sales not "seasonally adjusted". So what you're looking at here is a graph that shows monthly existing homes sales from 2005 to 2009. And what you're seeing is that for the 5th straight month, sales are higher in 2009 vs. 2008. And for 2 consecutive months now we've seen sales higher in 2009 vs. 2007. Why the improvement? It goes without saying many of these sales can be directly attributed to first time home buyers storming the market to take advantage of the $8000 tax credit. Though now extended through April 30th 2010, the original deadline was November 30th. The mad dash to beat the expiration this month certainly played a role in pushing sales above the normal levels - which would be somewhere in the 4 to 5 million a year range. This second graph you're looking at here shows nationwide inventory level for existing (not new) homes. NAR (national association of realtors) reports inventory levels shrinking to about 3 1/2 million in October. This is down from the upwardly revised 3 3/4 million a month prior. 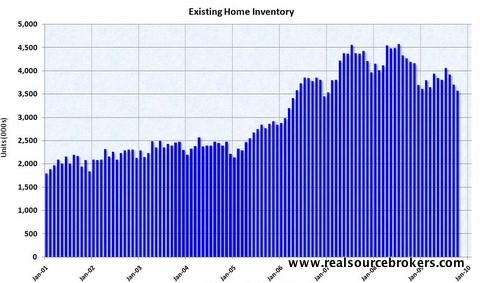 Inventory levels peaked back in July 2008 at over 4 1/2 million. It's typical to see shrinking inventory levels during the Fall / Winter season in real estate as many sellers who hoped to sell in the Spring and Summer months simply take there homes off the market so some of this decline can be attributed to that. 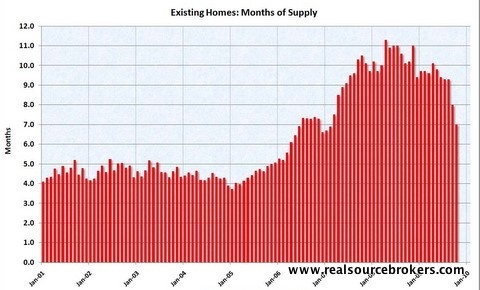 This third graph charts existing homes sales "months of supply" for the last 6 years. Months of supply is a primary indicator for the strength or weakness of the real estate market. For the month of October, we saw a decline to about 7 months of supply. Whenever we see a sharp increase in sales (as we did these last few months) and unmotivated Sellers take their homes off the market for the winter, we see a corresponding decline in "months of supply". Now ... a balanced market is generally measured as such with less than 6 months of supply ... so 7 is still a bit high. So the question I'm left asking is what happens come April 30th, 2010 when the Tax Credit expires and unemployment is pushing 11%? And what happes when the government stops incentivizing buyers with tax credits and low interest rates? And what happens when the 25% of homeowners who are "underwater" on their mortgage decide enough is enough and walk away?